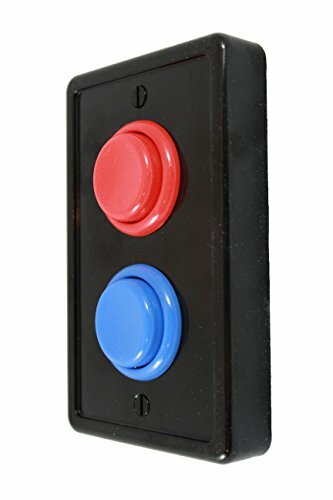 These Arcade Button Light Switch Covers by LightCore have a classic arcade game aesthetic that gives you a satisfying sense of nostalgia every time you turn on or off the lights. These push-button wall plates are loved by fans of video games and antique arcade games. They're great for any room in the house-especially kids' rooms, playrooms, game rooms, entertainment rooms, etc. The arcade button wall plates are easy to install wherever there is a rocker-style light switch in place. To install, all you need is a flathead screwdriver; everything else is included. Simply remove the existing faceplate and replace it with the arcade button faceplate using the included screws. The screws match the color of the faceplate. Installation instructions are included with each purchase. These arcade button wall plates are designed to cover flat rocker-style light switches (also known as paddle-style light switches). See the reference photo above if you're not sure what kind of light switch this is. If you have another kind of light switch, you'll first need to install a rocker-style switch in its place. These light switches are inexpensive at hardware stores and are easy to install. Once the arcade button cover is installed, the two buttons make contact with the upper and lower portions of the rocker switch so that one button turns on the lights, and the other button turns off the lights. The faceplates are available in either black or white. The buttons and button rings are available in a wide variety of colors, including yellow, neon green, blue, red, purple, pink, black, and white. This allows you to choose a color scheme that accents the room. Choose one of the color combinations shown in the product options above or choose custom to pick your own colors. All of these parts are interchangeable for maximum customizability. These fun light switch covers are designed for single (1 gang) rocker-style light switches, but we also make double (2 gang) switch plates.